Welcome to the Saddlebrook Appaloosas Past Foals page. Each mare and foal has their own individual page, accessed using the top bar. Saddlebrook Appaloosas stand Zip Me Impressive. Zippy has 50 Top Ten World, National and Year end titles, three bronze medallions and 14 ROMs. 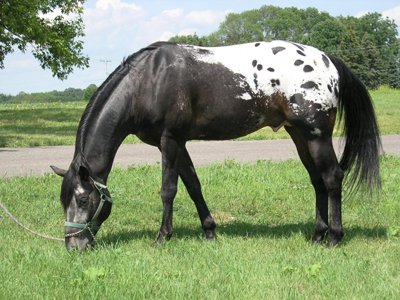 He is 2003 World’s Best Appaloosa, a two time Reserve World Champion and a two time Canadian National Champion. He is also a Reserve World Champion Producer. Zippy is HYPP N/N. If you own a Saddlebrook Appaloosas foal or mare and would like to share photos / updates OR you have a query about the website, please email Sam, our administrator, through the Contact Us Page. Thank you to those people who graciously allowed me to use their photos for this website: it could not have been put together without your help. Thank you to the Buddies for your support. Also, a very special thank you to Bill and Susan at Saddlebrook Appaloosas for sharing your lives – and your very beautiful horses – with us. Fritz is a big strong chestnut colt with a few sprinkles as a star, some white hair in the middle of his mane and lightning marks on his back legs. Fritz sadly passed away in April due to a leg injury. Flash is a chestnut colt with a gorgeous white blanket, lightning marks on his legs, a cute spot on his face and a frosted ear.